Mt. Rainer with Packwood Lake in the foreground on our first evening hike in. It's been a little bit since I posted my adventures. Climbing injures and a new van build-out has drawn my attention elsewhere. Hopefully, there will be some posts of the build out process in the near future. 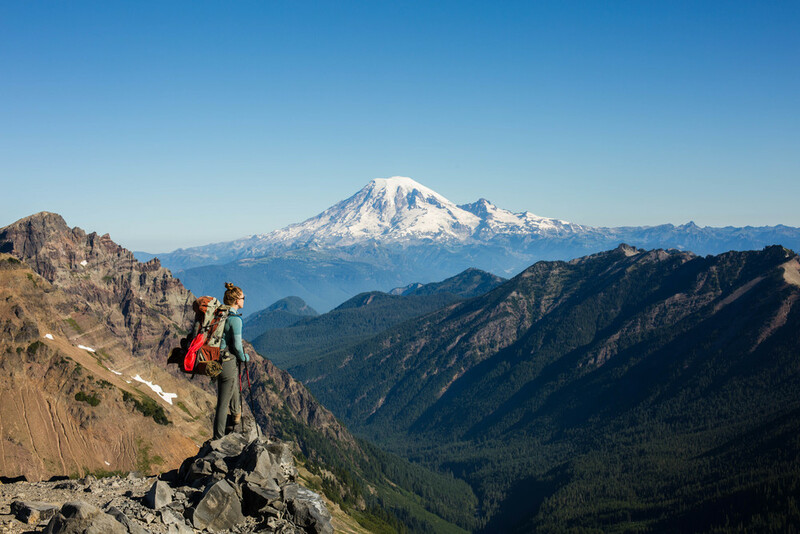 But now, for your reading pleasure, a little write up about a recent backpacking trip out in Goat Rocks Wilderness during the long 4th of July weekend. The first adventure of the trip was getting to the Lily Basin Trailhead. The short section of dirt road went up a steep incline, which was deeply rutted and rocky. It took a couple of tries, but my little CR-V got up it like a champ. We finally were able to put packs on and were on the trail by early evening. We timed out our first day perfectly as the majority of the elevation gain was done in the cool of the evening. As we ascended through the forest to get into Lily Basin, we were greeted with sweeping views of Mt. Rainier among expansive fields of wildflowers. These vistas and meadows were bathed in the golden setting sun, and we were rewarded with a beautiful pink sunset over Mt. Rainer (see cover photo). At this point, we broke out our headlamps and finished our first day's hike on the banks of Heart Lake. Tia as we finally reach the crest of the ridge and began to hike into Lily Basin. The next morning, we broke down camp and continued to traverse around Lily Basin. 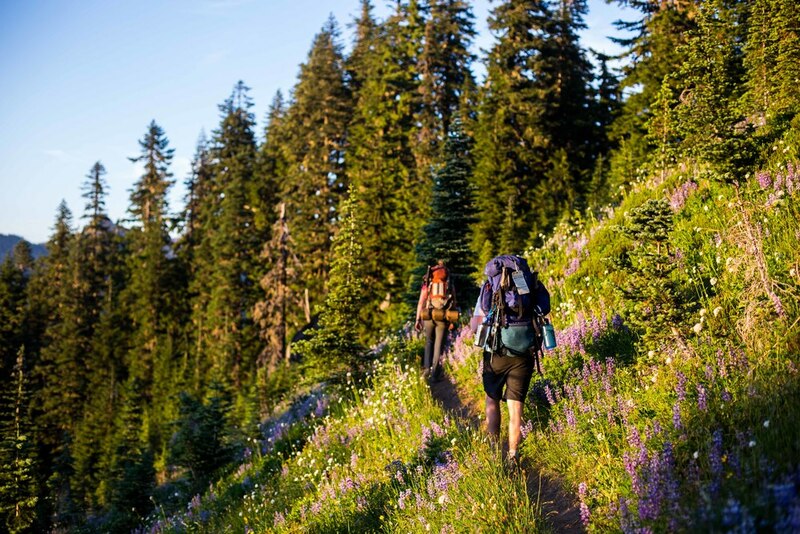 The trail gradually ascended through fields of wildflowers, through boulders and scree, and across a short snow field to reach a saddle, where the trail splits off to Hawkeye point. At this point, we got a lovely view of Mt. 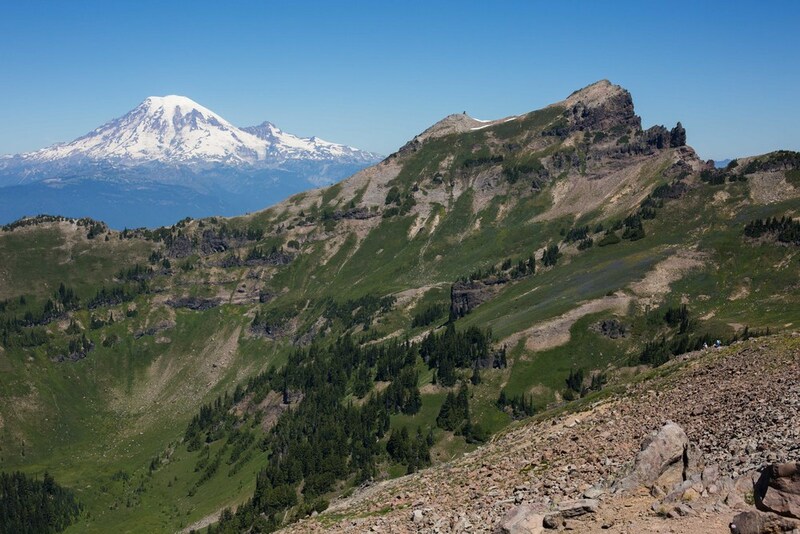 Adams, Rainer, and St. Helens, as well as Lily Basin and Snowgrass basin. We dropped packs for a quick food, yoga, and photography break. From here, the trail dropped down and passed by the picturesque Goat Lake. The day was heating up and the green glacial waters of Goat Lake were calling out to us. We took a lunch break drip in the icy waters. From here, the trail remained relatively flat and continued onto Snowgrass Flats. Once again, snowgrass flats was full of blue/purple lupine, and a myriad of other wildflowers. In the early afternoon, the camping spots around Snowgrass Flats were already filling up, so we decided to snag a spot that was just before the junction of the Pacific Crest Trail. We put up our tents and took a midday siesta to escape the heat and bugs. As we set up our camp, we noticed a plume of smoke rising from the southern flank of Mt. Adams. This was just one of many fires to plague the Northwest this seasons. After napping and eating, we decided to take a day hike out to Cispus Basin, down the Pacific Crest Trail. 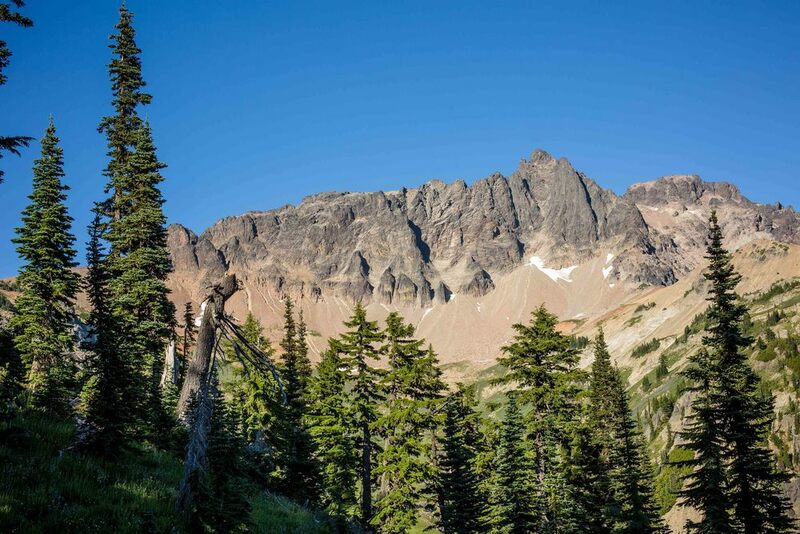 We traversed around Cispus Basin, taking in the beautiful views of the craggy peaks there. We stopped where a small waterfall crossed the trail and turned back to return to our campsite. On the way back, I stopped to take numerous photos in the golden-hour sun. The next morning we got an early start to try and get through the hard climbing in the morning so we could take another midday siesta. This portion of the hike joins the PCT for several miles. We climbed up rock and scree to get to the point where the PCT ascends up to Old Snowy Mountain. After stopping to take photos, we unknowingly went on the alternate stock trail, which traversed a couple snow fields and cut across several steep sections of very loose scree with only glaciers below us. 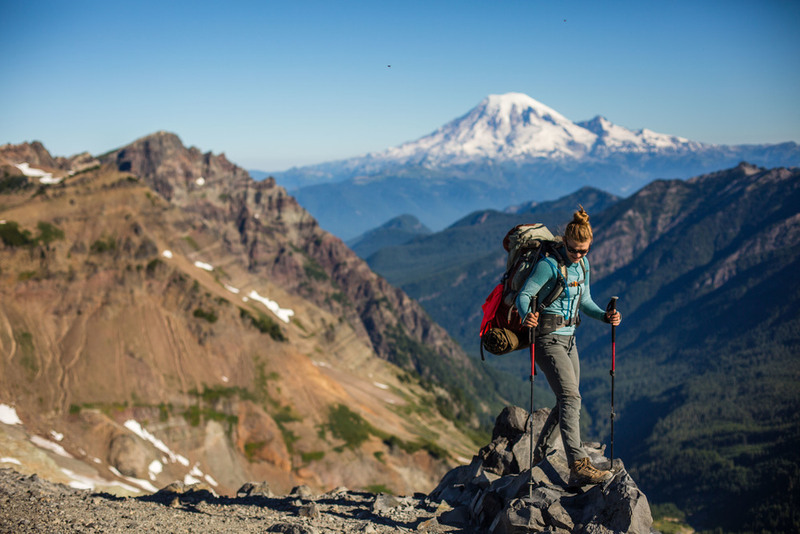 There were quite a few nerve-racking instances where you loose footing slightly and the weight of your pack shifts slightly towards the steep side of the trail. After these sketchy sections, we finally got onto the infamous Knife Blade section of the PCT. I believe this is the highest point of the PCT in Washington. From the end of the Knife Blade, we took a junction trail which would lead us to our intended destination of Coyote Ridge and eventually Lost Lake. By the time we reached this point, the sweltering midday heat reached its peak. We collectively decided to the elevation gain on Coyote Ridge would be too strenuous and we decided to take the low road and descend all the way down to Packwood Lake, thus shortening our last day's hike out. Little did we know that the descent was particularly grueling with a steep, knee pounding trail crossing in and out of a creek bed with fallen trees blocking the trail, creating the ultimate bush-wacking, trail-finding adventure. After what seemed like an eternity, we finally reached Packwood Lake. 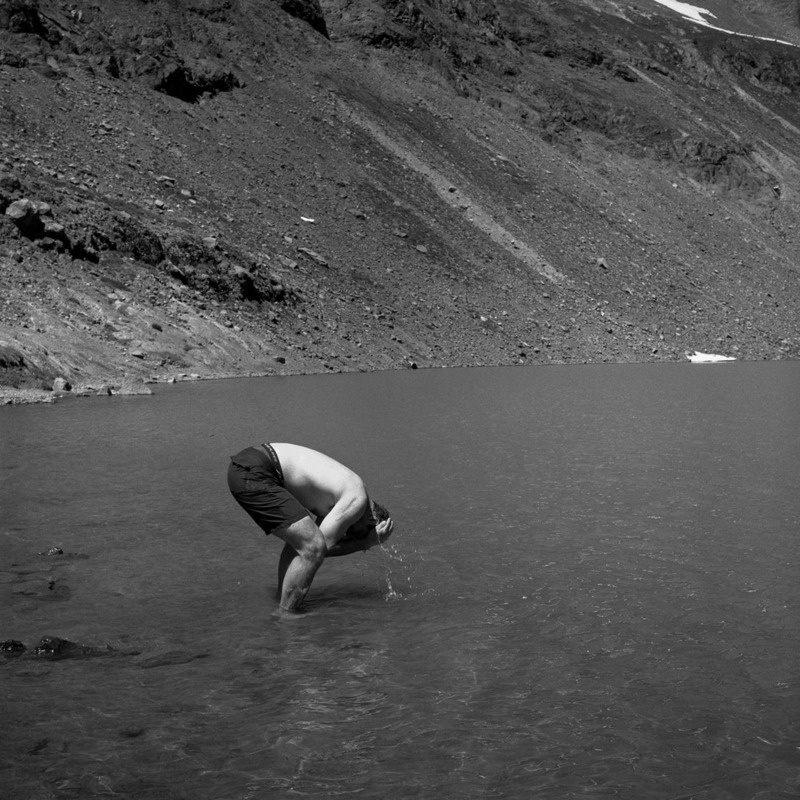 We found the first lake-side camp spot we could, stripped off packs and clothing, and jumped in the lake for a swim. (I have pictures of Packwood, but it's trapped in my Rolleiflex waiting for the rest of the roll to be shot). The next morning, we packed up camp and had a very short day to the Packwood Lake Trailhead. After another adventure to retrieve my car, we drove out to a burger shack in town to refuel our bodies and to reflect on our trip. Another successful 4th of July outing I would say, with some amazing friends and amazing scenery. I always enjoy my adventures with Kevin and Tia, and hopefully we will create more memories real soon. Most shots were taken on my Canon 5d Mark III. Black and white shots were taken on my Rolleiflex 2.8e on Illford HP5+ film.